The post Digital Marketing News: LinkedIn Top Content, Twitter Gets Character & Apple Goes Google appeared first on Online Marketing Blog – TopRank. I believe humor serves a different purpose throughout the three loosely-defined stages of a buyer’s journey. Call them top, middle, and bottom of funnel. Or call them Attract, Engage, and Convert, as our team does. The idea is the same: How you use humor should change depending on your context. Top of Funnel content can be mostly comedy designed exclusively to entertain people. This is what we call a chocolate cake or dessert post. The key difference between, say, a Buzzfeed post about funny tweets and your top-of-funnel content is that yours will be focused on a very specific audience. Use humor as a way of showing your audience that you understand them. That you’re one of them. Make jokes only they will get, and you will invite them into your tribe. That’s what I did with my 20 Jokes Only a B2B Marketer Will Get. I called out the audience in the title, and made sure each joke used vocabulary and common experiences that only the intended audience would share. 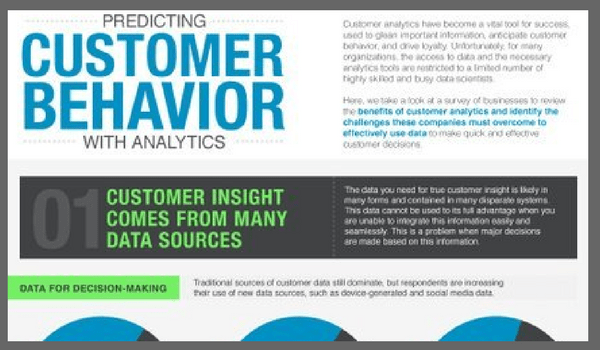 The result: One of the most-shared posts on the TopRank Marketing Blog this year. In the middle of the funnel-what we call the Engage stage-comedy is still a welcome component of your content. But unlike, top of funnel, the comedy can’t be the main attraction. You’ve already brought your audience in. Now you have to provide value beyond a chuckle or two. Start with a legitimately useful premise, and use humor to demonstrate personality and keep your content readable. For example, the introduction to this post on video content marketing on a budget starts with a funny intro and a truly hilarious image. Images are a great way to introduce a little humor, by the way-especially if you’re on a WordPress blog and the image can show up in the excerpt. By the time your customer is almost ready to make a purchase decision, you don’t need to keep throwing out the punchlines. They’re already sold on your brand’s personality; now they need to make sure your solution is the perfect fit. Bottom-of-funnel content is by necessity more utilitarian, more focused on your offering. But you shouldn’t suddenly become all business all the time. Aim for a consistent brand voice throughout the buyer’s journey. You can still be lighthearted and informal on a landing page or a contact form. The same comedic approach won’t work for every brand or every audience. People who love zany one-liners from a fast-food company likely don’t want the same from their bank. 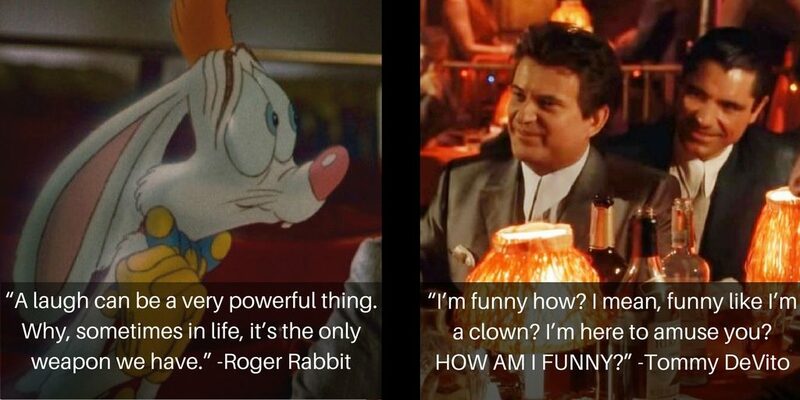 It’s important to find the degree of comedy that puts you firmly on the Roger Rabbit side of the equation. That said, if you keep your level of humor appropriate for the stage of the buyer’s journey, you can attract your audience, engage them with entertaining but valuable content, then convert with the same sense of personality and fun that attracted them to begin with. Learn more about humor in content marketing from a master of the form in this interview with Tim Washer. 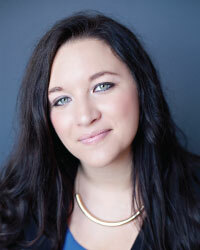 LinkedIn Marketing is a TopRank Marketing client. 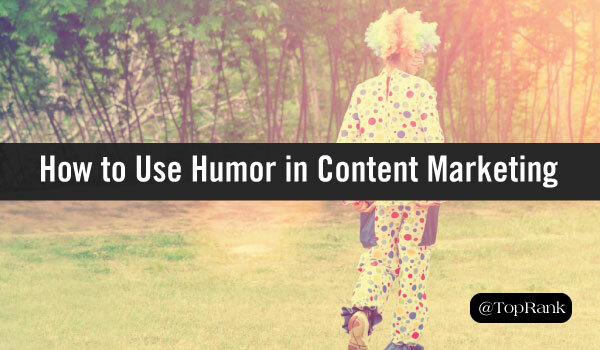 The post Funny Content, Serious Business: How to Use Humor in Content Marketing appeared first on Online Marketing Blog – TopRank. However, as the digital landscape becomes increasingly crowded with content – and you feel more and more pressure to create content in less time – you’re likely looking for quick and dirty ways to create SEO-friendly, best-answer content that doesn’t require loads of your precious time. As a result, your first stop on the research train is likely Google’s Keyword Planner tool. But, let’s face it, while it’s an excellent tool, it can only get you so far. The good news? There are several helpful research tools that can help you uncover real questions your audience is asking around the web – allowing you to gain new audience insights and fill your content plan with relevant, SEO-infused topics. Below we dive into some of those research tools that can help you do just that. Answer the Public brings Google’s auto suggest feature to visual life. Type in any keyword or phrase, and the almost immediately you’ll be served up a visual representation of queries that are organized by specific question modifiers such as who, what, where, when, why, how, will, are and can. What makes this tool so fantastic is that it not only helps you identify topics, but potentially some of the nuances of intent behind those questions. The best part? It’s completely free and you can sign up for a short email course to help you use the tool like a pro. 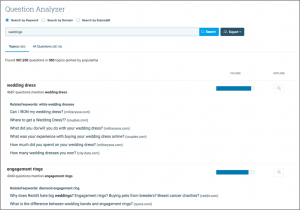 BuzzSumo‘s recently launched Question Analyzer feature is incredible, allowing you to find the most popular questions being asked from across the web. How? Essentially, BuzzSumo has created a database of real questions from thousands of platforms, including forums, Amazon, Reddit, Quora and other Q&A sites. Just type in a keyword and get a list of related questions sorted by topic, as well as details on volume. Total access to this tool does require a BuzzSumo Plus subscription; however, you can sign up for a free trial for this feature and try before you buy. Like Answer the Public, bersuggest pulls in various Google’s auto suggest keyword queries. And while the tool doesn’t create the same kind of visual representation of questions, the Word Cloud feature does help you connect the dots in a more visual way. In addition, each keyword query allows you to select Google Trends so you can get a closer look at seasonality – which is great for future planning. Finally, bersuggest prides itself on being a tool that can help you uncover new keywords that aren’t available in Google’s Keyword Planner tool. Of course, we can’t mention Answer the Public or bersuggest without mentioning KeywordTool.io. Like the former two tools, KeywordTool.io also uses Google’s auto suggest queries as its data source. In addition, like bersuggest, KeywordTool.io allows you to tap into Google Trends and find keywords that aren’t readily displayed in Google Keyword Planner. So, on the surface, the main differentiator between these tools is user experience. However, from what I can tell, KeywordTool.io’s paid version, Keyword Tool Pro, offers a little something different than the others. According to the website, Keyword Tool Pro will not only give you keywords that are hidden from everyone else but will also provide you with necessary data to sort and rank the newly discovered keywords. You will be able to see how often people search for a keyword on Google (Search Volume), how competitive (AdWords Competition), and lucrative (CPC) the keywords are. For many marketers, the final benefit may be the most intriguing, as we’re always looking to connect business value to our efforts. 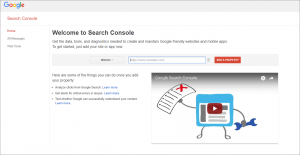 Google Search Console, formerly Google Webmaster Tools, is one of the most helpful SEO and content planning tools out there. From a technical standpoint, Google Search Console enables you to monitor and maintain your entire website’s presence in Google search results. But from a content planning perspective, Google Search Console allows you to see which queries actually caused your site’s content to appear in search results. Back in 2011, Ahrefs launched as an backlinks analysis tool. Since then, the tool has grown into a helpful competitive analysis tool, allowing users to get a deeper understanding of how and why their competitors are ranking – and how they may be able to leapfrog them in the SERPs. 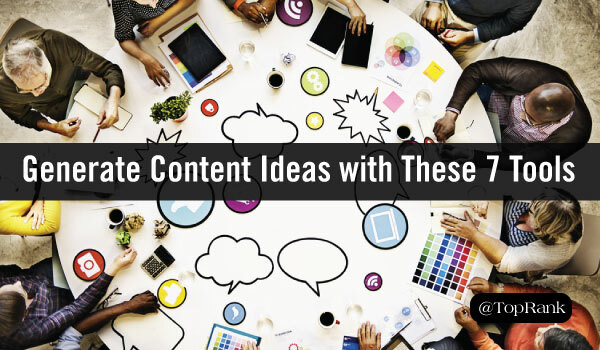 When it comes to generating SEO-infused content ideas, there are a few features that are useful. For starters, the Keywords Explorer allows you to find keywords, analyze their ranking difficulty and calculate the potential traffic you could achieve. Then you have the Content Explorer, which helps you find the most popular content for any topics based on backlinks, organic traffic and social shares. Finally, the Content Gap feature allows you to explore the keywords that your competitors are ranking for, but you don’t. While this tool isn’t free, you can sign up for a free trial. If you like it, there are a handful of monthly subscription options at different price points. Generally speaking, SEMrush offers a lot of the same benefits as Ahrefs – from discovering and analyzing keywords to conducting competitive analysis. 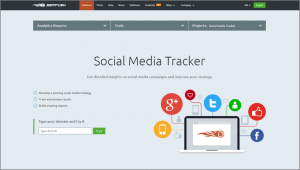 But one feature that is particularly interesting and helpful is the Social Media Tracker. These days, social media marketing is an important and necessary part of any digital marketing strategy, serving as an engagement and content dissemination platform. With the Social Media Tracker, you’re able to compare your engagement trends to that of your competitors, as well as see the best-performing posts in terms of engagement. You can then use these insights to craft better, more relevant content that will get more traction on your social pages. How Do You Choose Which Tools Are Right for You? Your industry, budget, internal resources and unique business objectives are all deserving of consideration when selecting research tools that will be a good fit. But, with nearly all of these tools offering free usage or free trials, you certainly have nothing to lose by carving out a little time to test them out. So, choose one to start with and go from there. What are some of your go-to research tools for generating interesting and relevant content ideas? Tell us in the comments section below. The post Beyond Google Keyword Planner: 7 Easy-to-Use SEO Research Tools for Generating Content Ideas appeared first on Online Marketing Blog – TopRank. A quick look at Google Trends comparing Influencer Marketing to other marketing disciplines shows a near hockey stick growth trend. Since my team consults and I advocate, write and speak about influencer marketing so often, people often ask me: Is influencer marketing a real trend?. One of my all-time favorite conferences of the year, B2B Forum is where I get to truly geek out on B2B influencer marketing with some of the smartest B2B marketers in the world. And there’s Ann Handley too who would want to miss hanging out with her? No one! 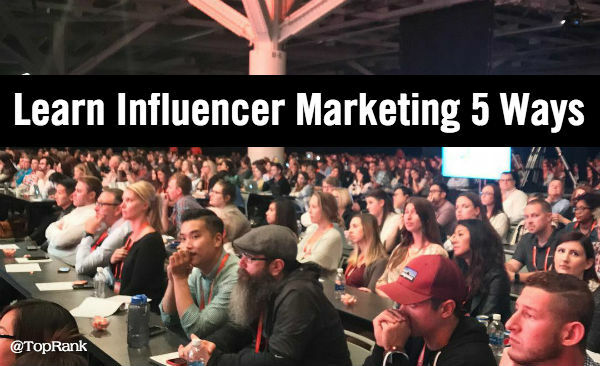 The post Learn Influencer Marketing 5 Ways appeared first on Online Marketing Blog – TopRank. The post Digital Marketing News: Predictive Analytics, Blockchain and Email Marketing Industry Report appeared first on Online Marketing Blog – TopRank. 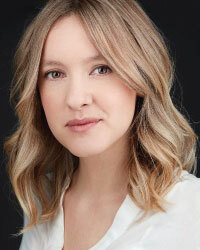 What would compel a buttoned-down, professional networking site like LinkedIn to embrace video? Simply put, people-even businesspeople-want to watch. Fifty-nine percent of executives say that if text and video are available on the same topic, they’re more likely to choose video. If your account has video enabled, you will see a camera icon available where you normally post to your feed. On mobile, you can create a video (not a live streamyet) or upload from your photo gallery. On desktop, you can only upload a pre-recorded video. Nearly every common form of video file is supported. To record a video, just tap the camera icon, give the app permission to access your camera, and go. To upload video, just navigate to the file you want to add and select it-there’s no learning curve there. 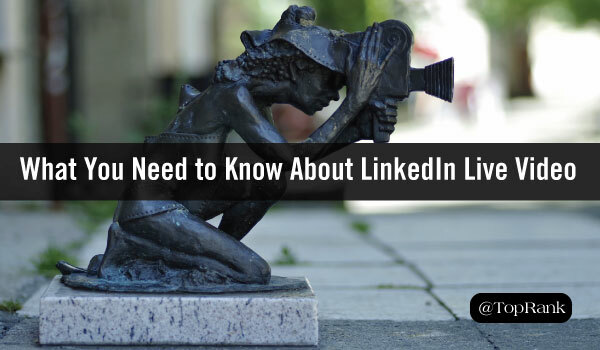 So native video matters-and for virtually all B2B marketers, LinkedIn matters. 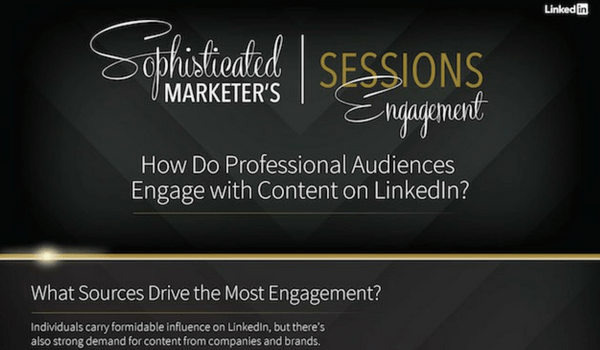 While Facebook videos can be dominated by memes and entertainment, the LinkedIn audience is specifically there for business. They’re browsing their feeds looking for something that can help advance their career, give them a competitive edge, or just do their jobs better. Useful, professional video content is likely to fare better on LinkedIn than on Twitter or Facebook. 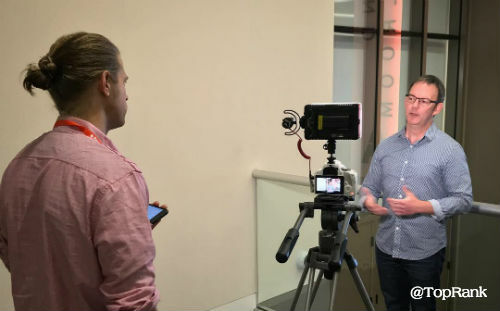 The post LinkedIn Native Video: What Works, What Doesn’t, What Marketers Need to Know appeared first on Online Marketing Blog – TopRank. If you haven’t met Nick before, you should. He made every part of this experience amazing for speakers and attendees alike. 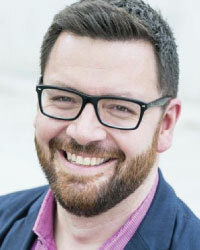 In addition to serving as a Chief Brand Strategist, Nick is also an author, professional speaker and an Associate Director, MBA Business Communication at the University of Iowa. Nick believes that a scrappy approach to B2B marketing can help teams large and small get smarter with their digital marketing. 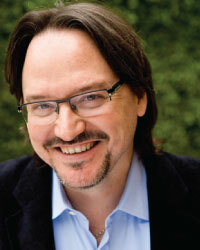 His book, Get Scrappy is filled with great ideas and examples for brands looking to do just that. One of the key points of Robert’s presentation that stood out to me, was his thoughts on how technology has impacted the way we work (both positively and negatively). 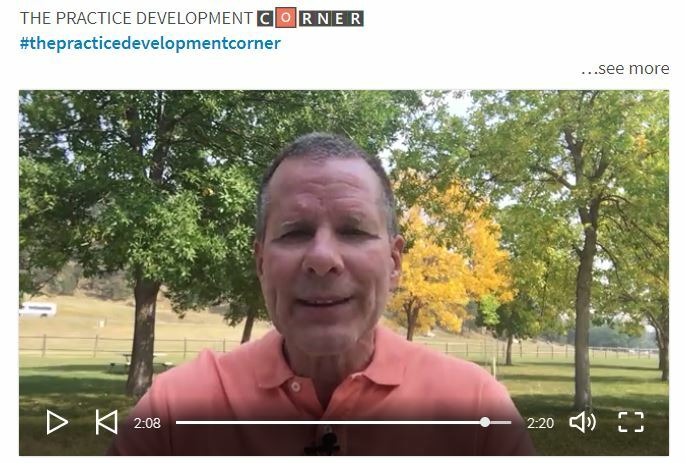 As we start each year, we plan to accomplish great things with our content but quickly realize we need more content, more technology and more people to get it done. But the honest truth is, more isn’t always better. Content teams should not become asset generators that simply pump out content, the focus should be on becoming more strategic and purposeful with content planning, creation, promotion and measurement. 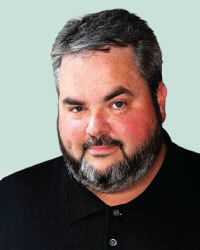 Yesterday also marks the release of Robert Rose and Joe Pulizzi’s new book, Killing Marketing. Keep your eye out for a review of this new book on our blog in coming weeks. For most of us, the thought of a crisis doesn’t even cross our minds until we’re in the midst of experiencing one. And that is something Melissa Agnes set out to change in her presentation. Key to successfully managing a crisis is having a crisis ready culture. A crisis ready culture is one that has developed a plan, shared the plan with the team and keeps the plan closeby in case it is needed. One of the biggest takeaways for the audience was the fact that an issue and a crisis are not the same and how to deal with each scenario effectively. True to form, Jason started off his presentation telling jokes, stories and commenting on how hot it was on stage (I can attest, it was). 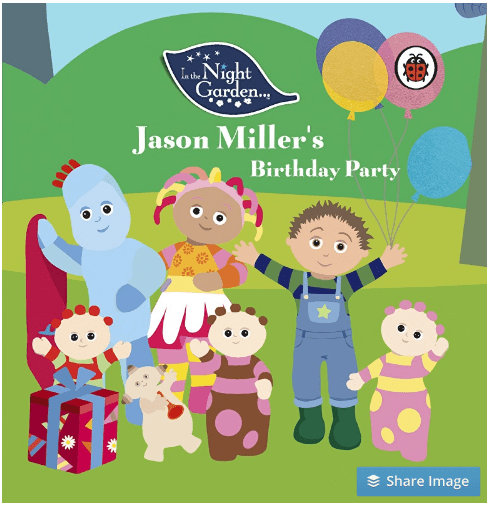 I have seen Jason present a few times and each time is a great experience, but there was something extra special about this presentation. In order to participate in or hack conversations your customers are having, you first need to know what they are. Unfortunately a lot of these conversations happen on more closed networks like Facebook which can make it difficult to uncover what is being said. Ultimately, marketers need to understand that keywords do not equal themes and raw data is not the same as actual insights. 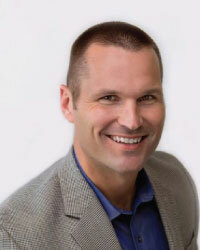 Marcus is a strong proponent of truly integrated sales and marketing teams. And he’s right, he’s proven how effective this approach can be. In today’s digital landscape, media is no longer reserved for publications. Brands have become publishers and let’s be honest, are publishing content at an alarming rate. Unfortunately, Marcus has found that most content starts as fluff when it should always start at the buyer. Teams must begin thinking more strategically and utilizing content intentionally in the sales process and beyond to better meet the needs of today’s savvy buyers. When I was creating my presentation for the Social Brand Forum, I began building out some tactics that I thought the audience would find interesting, then as I thought about it further, I decided that instead of tactics, we should focus on the common hurdles that content marketers face. As a special treat, I’ve included a copy of my deck below so that you can experiencethe world of Wonka on your own time (if only I could get the GIFs to work in SlideShare!). Whether you were able to attend in-person, or followed along online, I’m curious to know what you found to be the most interesting tidbits of information offered at the annual Social Brand Forum. 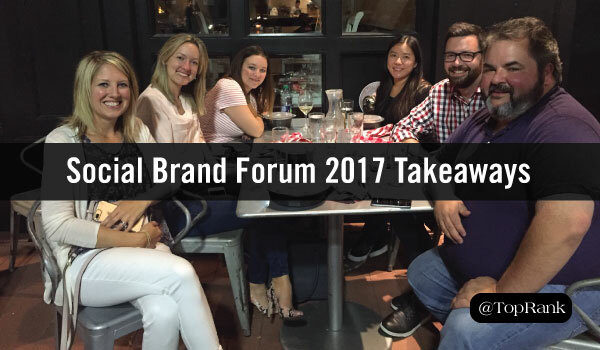 The post Top Insights, Takeaways & Favorite Moments from #SocialBrand17 appeared first on Online Marketing Blog – TopRank. In content marketing, much like cooking, there is an overwhelming amount of options for composing content or content strategies. It can feel like there are too many cooks in the kitchen, countless ingredients to choose from, or numerous recipes to follow that it becomes impossible to form a cohesive content plan. So to help you break down the necessities and create captivating content, we gathered four tips for constructing delicious content inspired by-you guessed it-cheeseburgers. Similar to the bun on a burger, the introduction and conclusion to your content supports the meat of your message. Set yourself up for success with attention grabbing, empathetic introductions and conclusions to drive your point home. While supporting the content on the page, the introduction and conclusion sections are also great opportunities to support your business as a whole. Mentioning your experience, products, or services help highlight your expertise and reinforce your credibility. Even more important, no one likes a soggy bun! That’s why the best chef’s place the lettuce directly underneath the patty-it keeps the juices from seeping into the bun. Keep your content clean and clear and by writing distinct section headers. This will help structure your content in an easily digestible way and make sure your thoughts are well-organized. Just like a burger, content without meat (or protein for our vegetarian and vegan readers) just doesn’t cut it. Your content needs to be worth your audience’s time or else it won’t produce results. The secret to noteworthy, memorable content is offering hearty advice to your readers in the form of listicles, steps, tips, or guides. One of the best ways to create valuable content is to answer common questions your audience might have and pack your answers with statistics, quotes, and anecdotes that validate your point of view. This ensures that your audience can find a solution to their problems with your content. And because you’re answering a specific, commonly asked question, this strategy could also help improve your ranking in voice search results. Burgers are commonly found in grills and restaurants across the country, so to keep surprising guests with new inventions, Chef’s often experiment with different food textures. The same should be done with your content marketing. As content marketers ourselves, we know that reading several blog posts each day can get boring, so why should we put our audiences through that? We need to surprise them with something different. Create crunchy content moments of your own by producing a mix of blog posts, podcasts, videos, case studies, and more. The variety helps break up any monotony in your current content strategy and entices audiences with new formats. In fact, four times as many customers would rather watch a product video than read about it, according to Animoto. And in addition, your mix of content creates cross-linking opportunities that will potentially boost your search rankings or traffic. A good sauce is the difference between a great burger and an excellent one. It is one of the only burger ingredients that can completely change the flavor of each bite. In terms of content, we believe that the difference between great and excellent content is an oft-talked about, yet little utilized tactic: SEO. Add search engine flavor to your content with SEO strategies like internal linking and optimized meta descriptions, tags, and headers. But before you start jam packing your content with keywords and links, make sure your internal linking fits naturally and has keyword optimized anchor text. And because engagement and external linking is an increasingly large factor in search rankings, add click to tweets and other easy-to-share links that make it simple for readers to circulate your content. 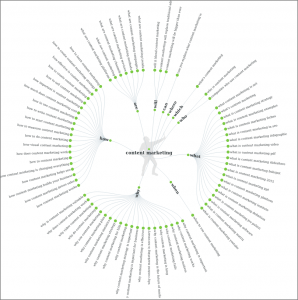 Need More Ingredients for Your Content Marketing Recipe? If you’re starving for more content marketing tips, learn how to master the perfect content marketing recipe with these 30 savory and sweet content ingredients. 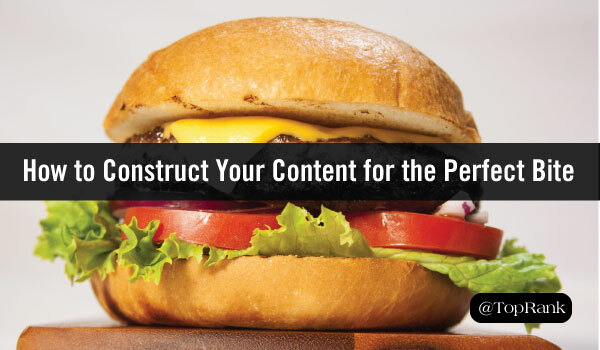 The post The Mighty Cheeseburger: How to Construct Your Content for the Perfect Bite appeared first on Online Marketing Blog – TopRank.